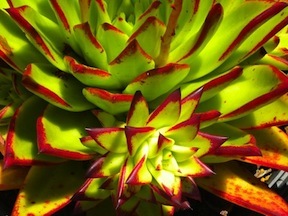 Here's a collection of images from both the field and the garden...images I shot while working & traveling around with people who have created some absolutely stunning, colorful, water-wsie gardens over the years - gardens locating throughout San Diego, the North county, the beaches and beyond. 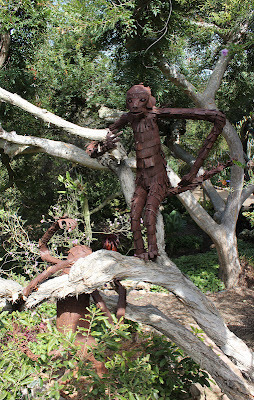 And check out the metal sculptures present in some of these gardens. Would you have thought to include this type of element? I love it. I will add additional text later on...work calls me from my studios, so I'm out the door...enjoy! The gorilla is perfect for this garden!! Bold, beautiful architectural shapes, plants from all over the world..South Africa, the Americas, Madagascar....why wouldn't you want to add a gorilla to your garden?!! Wild boar in cactus succulent garden...cool! Just a little shadow play...the Cactus brothers. 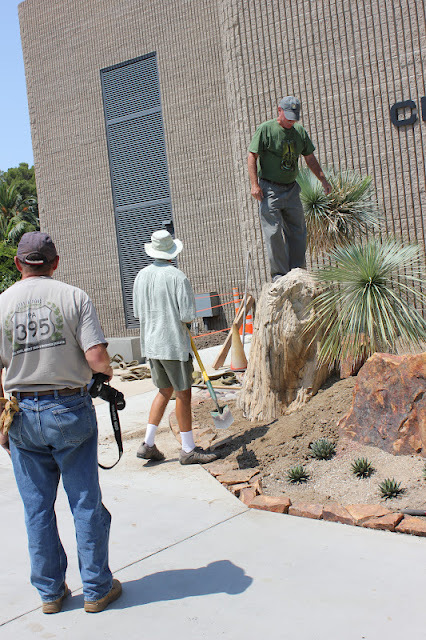 Following is a series of photos taken at Orange Coast College during the installation of a magnificent, enormous piece of petrified wood into the Cactus & Succulent Garden. 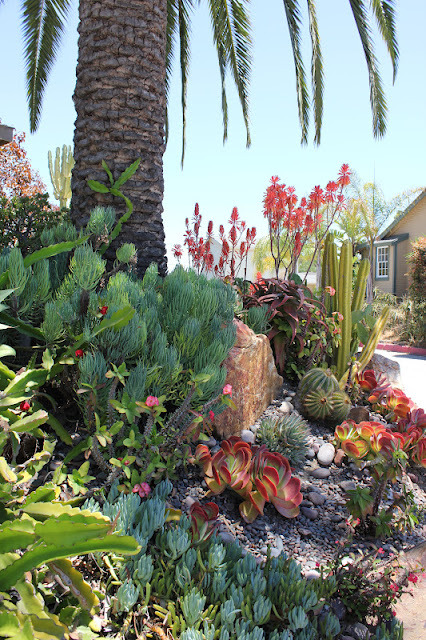 What a truly fabulous donation and addition to this new garden...check it out. Here comes the boulder, crossing the college campus with the aid of a large crane. Getting the petrified wood to this position has already taken several hours of the crane operator's patient manipulation of both crane and boulder across campus. Using a kind of 'hopscotching method' the crane operator moved the boulder - first, he would secure the crane, then pick up the boulder and move it forward and put it down. 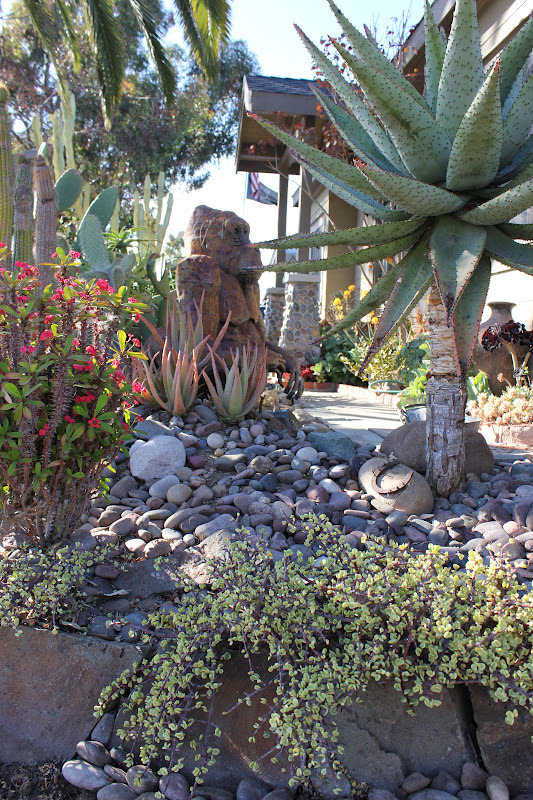 Then the crane would be free to move ahead of the boulder, at which time the crane would be 'secured' and then pick up the boulder - repeating the process until it made its way to the 'America's Garden' area - part of the larger Cactus & Succulent Garden. 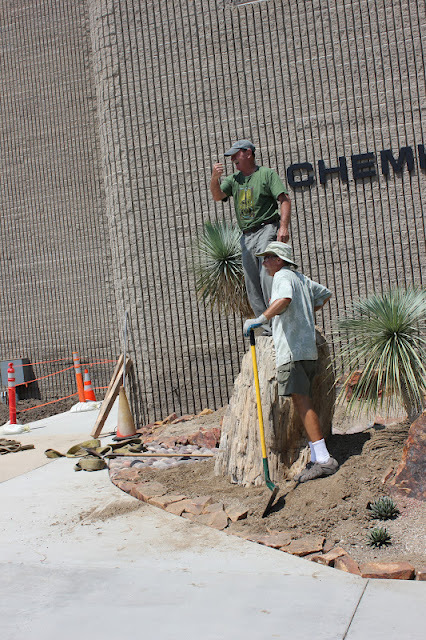 The arrival of the crane with the petrified wood boulder at the edge of the 'America's Garden' generated the need for some fast digging in the area where the petrified wood would be installed. The guys secure the harness around the boulder, and the crane operator slowly swings the boulder over the garden area and begins slowly lowering it down into place. Consider how much fun the guys were having 'working' around a huge crane and a monumental piece of petrified rock. Lots of fun! A pause in the action, the all important decision needs to be made - "how should the petrified wood boulder be installed?" On its side or in an upright position? In the end upright is chosen, and it turns out to be the best, final word. The guys have to get this right - manipulating the tethered boulder into position 'right now' - is the goal. Is it stable? Let's see...Michael Buckner, first man up. Joe Stead (Hort. Dept. Prof.) and the petrified wood/boulder benefactor's son. Cool. 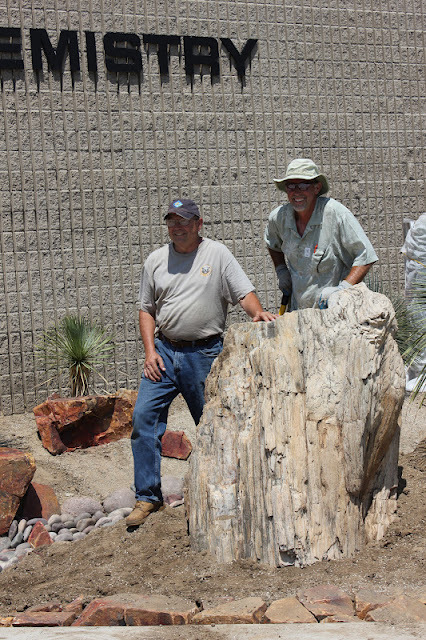 One monumental chunk of petrified wood has a found a new home at Orange Coast College in the Cactus & Succulent Garden. The students are particularly fortunate to have such an amazing garden on campus. Way to go Joe Stead!! The owner of this garden is clearly someone with a progressive aesthetic. 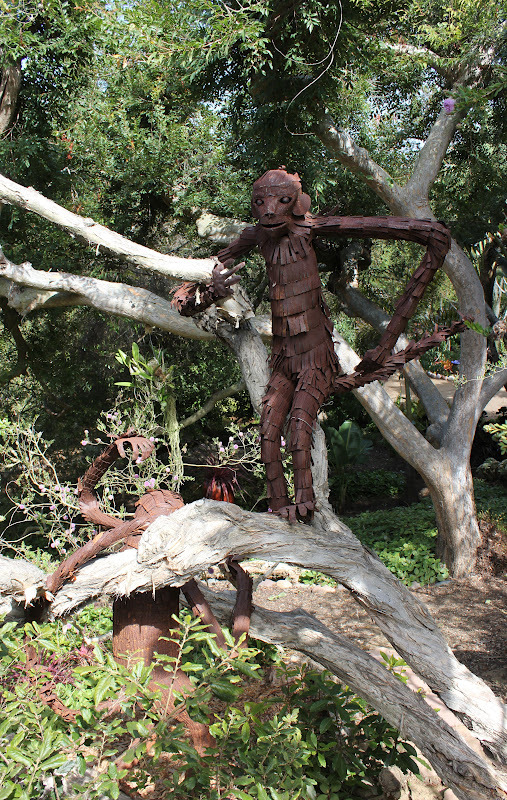 The presence of several terrific sculptural elements (such as this fabulous gorilla) throughout addresses her personal narrative - her personal expressive vision of what a garden is and what 'fun' a garden can be. In this private garden in Pt. Loma the owner's grandchildren are 'over the top' in love with these 'monkeys' hanging out in the tree tops.